In today's highly competitive global business environment, organizations need to aggressively compete for new markets, products, services, and top human talent in order to develop and sustain competitive advantage in the global arena. For many years, international firms have effectively managed their financial and material resources globally, leveraging economies of scale, low cost production, currency fluctuations, and the like. Human resources, as all other resources in multinational firms, are now being managed on a global scale. Global Business Strategy – How does human talent affect international integration, local responsiveness, and worldwide innovation and collaboration? Comparative HR Systems – What are the cross-border differences in employment and labor laws, workforce competence (e.g., literacy rates and educational systems), labor economics, and unionization? Cross-Cultural Differences – What are the cross-national differences in the ways individuals gain trust and credibility, communicate, and work together? 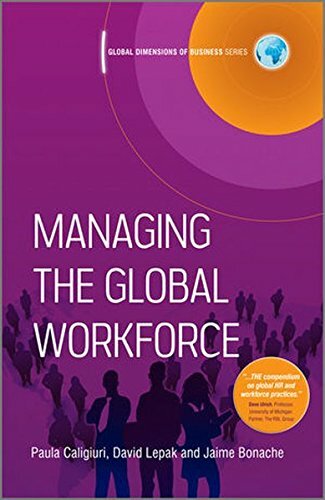 Managing Work Design and Workforce Planning – What are the strategic, comparative and cross-national contingencies related to the global mobility of jobs, the movement of employees, and cross-border knowledge work (e.g., transnational teams, virtual teams)? Managing Competencies – What are the strategic, comparative and cross-national contingencies related to recruitment, selection, training and development of the global workforce? Managing Attitudes and Behaviors – What are the strategic, comparative and cross-national contingencies related to compensation, incentives, performance management, and motivational reward of the global workforce?